In a world far removed from ours, Grimalkin and Mousekind live together in less than harmony right alongside more fantastical beast folk. Much like our own, these factions don’t always see eye-to-eye and engage in their own political dealings. 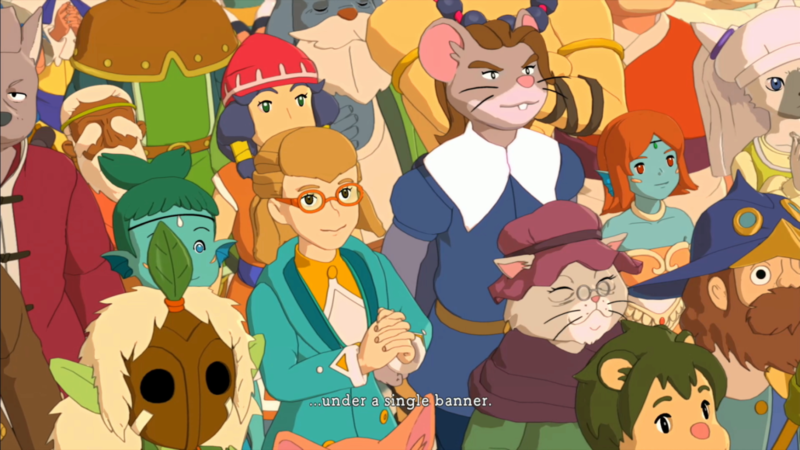 Sometimes it takes an outsider to bring about a great change to the land, and in another world where magicks are as commonplace as technology, some big changes are about to happen in Ni no Kuni II: Revenant Kingdom. Overthrown and cast out from his rightful throne in Ding Dong Dell, young King Evan Pettiwhisker Tildrum is usurped by ratfolk shortly after the death of his father and left for dead. Through the aid of a gentleman from another world, Roland, the pair move to amass a militia to take back Ding Dong Dell. However, as more and more folks rally under their banner, soon Evan decides to form his own country and become the first person within his world to act as a great unifier, crafting a Declaration of Interdependence and allying all five nations under a common banner to end strife and defeat a common enemy (voiced by none other than Kazuma Kiryu’s voice actor in the Japanese dub, strangely enough). 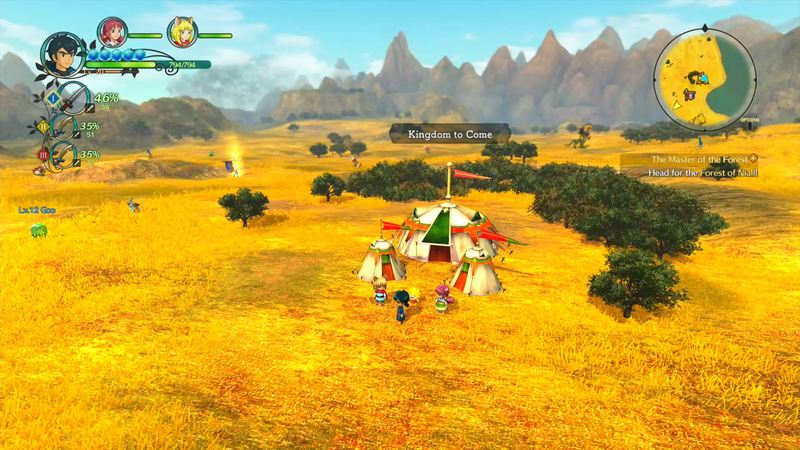 Despite the sequel numbering in the title, Ni no Kuni II: Revenant Kingdom should be treated as another world, with no preconceptions or necessity to play the original titles. Evan’s journey in the land of Evermore might have a few winks and nods to the PlayStation 3 title, but there’s thankfully no required viewing in order to enjoy this adventure. In fact, the major plot points from Wrath of the White Witch are summed up nicely with an early game puzzle box, giving the player a brief narrative about Oliver’s story and the significance of a magical artifact known as Mornstar. Even without knowing these facts, there’s nothing that will diminish a newcomer’s enjoyment with this storybook adventure. If you loved the familiar raising from the first title, finding and nurturing Higgledies feels like a step back and excessively streamlined, turning it into an element I barely felt necessary to dive into. In order to be a successful King, Evan Pettiwhisker Tildrum needs to master three tenets: Courage, Leadership, and Bravery. The first tenet is Evan’s willingness to charge into battle alongside two of his closest advisers in combat. This marks the biggest shift from the original Ni no Kuni, as battles are now fought in an action RPG sense in some of Level-5’s best combat since Rogue Galaxy. Characters can wield three different melee weapons in combat (all of the same class, sadly) and rotate among them for one major reason: Zing. This added effect can boost transform skills into something truly powerful, so it’s important to use the skill of your choice when a weapon is at 100% Zing. 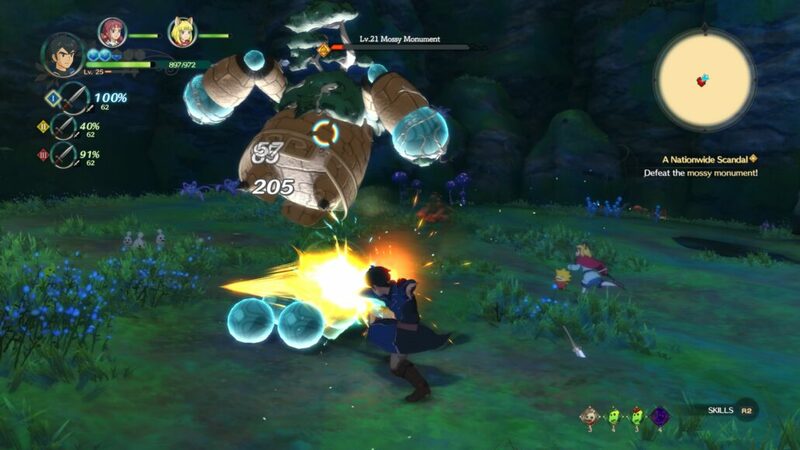 MP, in the traditional sense, is done away with in Ni no Kuni II: Revenant Kingdom, with abilities consuming a select number of MP orbs that are recovered by dealing damage and other various means. To rebalance this, spellcasters offer no traditional healing spells (only two get the means to resurrect towards the end of the adventure) and consumable items can only be used a set number of times per encounter. If Evan starts punching above his weight and fighting monsters more than ten levels higher, no amount of Soreaway can save him from an early grave. While each character only has a select number of spells at their disposal, they balance out the game’s combat beautifully. Evan and crew are free to run about the battlefield, slashing and shooting their way to victory or dodging perilous attacks in seamless combat that require no load times to enter (battles on the overworld are the exception to this, taking place in miniature arenas). While they’re both sword users, I found myself drawn naturally to playing as Roland for nearly the entire adventure. The Chief Consul comes equipped with a handgun as his ranged attack, something rare for a Ghibli adventure, and some of his abilities make quick work of enemy defenses or strike for multiple hits. His final ability, Executive Order, was essentially all I needed for boss fights with its massive damage, frequently striking critically for over 10,000 damage. King Evan’s ability to lead is an equally important aspect of the adventure in Ni no Kuni II: Revenant Kingdom. As his renown becomes wider known across the land, citizens looking to start a new life are willing to join his cause. All too often, they require a fair bit of convincing by having King Evan take on small side-quests or defeat monsters on their behalf to join up. Never since Suikoden have I had such an eclectic group of citizens that all wanted to unite under a common banner. In a world that hasn’t known peace and unification, some are willing to take that chance under Evermore’s flag. Those that aim to join his rallying cry can be a useful member of society and put their skills to use for the betterment of the kingdom. 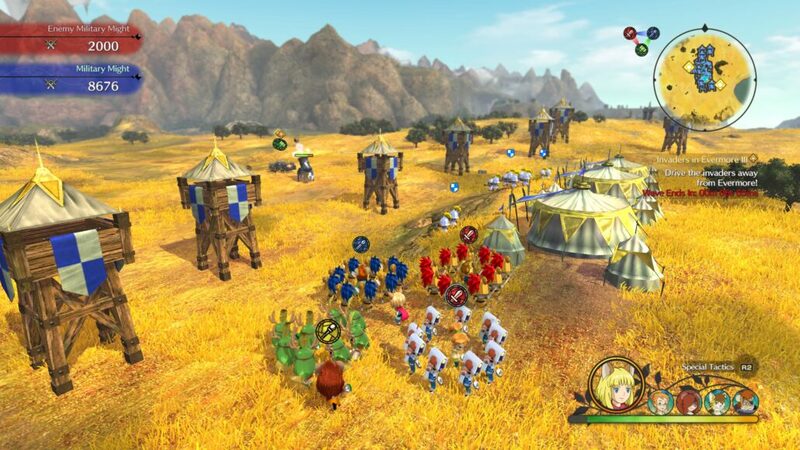 Ni no Kuni II: Revenant Kingdom’s weakest aspect revolves around the Skirmish missions that require Evan’s prowess as a tactician live on the battlefield and show an example of his bravery. Fought in the open world, these story (and optional) missions bring Evan onto the field of battle with four units accompanying him. These units are drafted from the same citizens that make up the kingdom of Evermore and operate on a simple rock-paper-scissors trifecta of effectiveness against other types: swords beat hammers, hammers beat spears, spears beat swords, with a couple of other wildcard classes as well. These battles are a simple display of rotating whichever units are most effective around Evan and charging into the enemy lines, bumping into the enemies until one side is defeated. Early on, there isn’t much complexity beyond this in Skirmishes, but as new troop units are unlocked and Evan has some kingsguilders to spare, the usage of additional Might and Guts power-ups give some much-needed power-ups and restorative abilities to his army. Only a handful of these missions are required for the story, but as part of earning that elusive platinum trophy, I went through fifty of these on both the standard and unlocked Hard Mode variants. As King Evan’s infamy grows in the kingdom of Evermore, it’s important to have the castle town grow to match. When not strolling the wilderness or trying to save the world, managing Evermore is where King Evan will spend most of his time constructing new buildings and using the cash flow to pursue new technological upgrades and building types. Wrapped up under the guise of a clicker, Evermore’s flow of kingguilders continuously stream in; as more citizens join the kingdom or new buildings are constructed, that flow of currency increases. After every quest, I’d make an active effort to stop back at Evermore and cash out the coffers and acquired loot to immediately reinvest it into new research. So many of the upgrades align with Evan and crew’s grand adventure that I couldn’t dismiss this mode as merely a side diversion; Evan’s equipment upgrades and spells are unlocked through Evermore research, as well as upgrades to other matters such as consumable food buffs of being able to traverse the Dreamer’s Doors more efficiently. If you’re looking for a brief, whimsical JRPG, Ni no Kuni II: Revenant Kingdom has a level of quality you won’t find anywhere else. It’s cute, introduces players to a magical world of all manner of beasts and magical creatures, and wraps up nicely within the 40-hour mark. However, if you’re looking for something meatier and more substantial, Level-5 offers an incredible amount of post-game content while trying to toe that line of giving their latest JRPG too much bloat. Dreamer’s Doors are Ni no Kuni II’s version of randomized dungeons, giving players miniature adventures across a few floors in search of rare weapons and high-powered bosses. It isn’t until the tenth and final Dreamer’s Door that the skill challenge flips itself on its head and forces players to take a much more restrained approach. Without finishing up the Evermore research tiers, this 30-floor is nearly impossible with enemies easily breaching over level 99 if players take too long. However, this is where the crafting materials are hidden for all of the party’s endgame gear and is well worth taking a few trips even through the lower floors to craft together some nice 400+ strength weaponry. There’s also a set of fifty rare tainted monsters that outclass the standard bosses hidden throughout Evermore and rumor has it some even stronger hunts exist after all fifty bounties are complete. The style to Ni no Kuni II: Revenant Kingdom is unmistakable with all the charm of a Studio Ghibli release. While the studio proper wasn’t involved this time around, the team at Level-5 have done a beautiful job recreating that signature style in a bright and colorful storybook adventure. Joe Hisaishi, the composer known for some of Ghibli’s most memorable tracks, has returned to score Revenant Kingdom. Admittedly, I found his songs to be whimsical but ill-fitting for a full-length RPG. Some of the town themes are great to listen to the first few times around, but once they loop again, they quickly lose their charm. That being said, the victory fanfare after combat fits beautifully and the seamless shift from the battle theme is something that I absolutely have to give the sound team credit for. The game is also the first Level-5 title to be released on PC and for a debut, it’s a solid one. There are several graphics options to choose from, including HDR support (which unlike most PC games won’t require you to first turn HDR on in the Windows 10 control panel). Most importantly the performance is great with the exception of some occasional frame drops; these usually happen when you get too close to certain particle effects such as cannon explosions. Below you can find a gameplay video captured from an i7 6700K, GTX 1080Ti powered PC where the game looks simply gorgeous at max settings, though admittedly more because of its artwork than due to impressive technology. Review code provided by the publisher. You may purchase the game for PlayStation 4 via Amazon and for PC via Fanatical. Watching King Evan Pettiwhisker Tildrum grow from a usurped young king into the leader of a global superpower and ruler of Evermore is one of the most memorable journeys in recent JRPGs.